Can I Start Tae Kwon-Do at a Later Age? Jerry is a veteran of the Marine Corps who began his Tae Kwon-Do training at the spry age of 64. Physically active most of his life, he wanted to try something different to keep him loose and agile. As a father, grandfather, and soon to be great grandfather, Jerry knew he needed to stay active if he was going to keep up with all the kids. Because of his military background, Jerry was fascinated in hand-to-hand combat and wanted to learn the different martial arts self-defense techniques. He signed up for our sparring package which includes a gym bag, helmet, boots, mouthguard, and hand gear. Jerry may not be able to eat corn on the cob, but he understood his age wouldn’t prevent him from starting Tae Kwon-Do. My older students all worry about the same three things before they begin training: Am I too old? Am I fit enough? Am I going to get hurt or injured? These are not issues. You’re never too old. We’ll make you fit. And if you do as I tell you, you won’t get hurt. So come in and let me help you. If you follow our program you’ll get into the best shape of your life. You’ll have a healthy body and positive attitude which are needed to live longer. Older people who study Tae Kwon-Do have better balance and flexibility. You’ll maintain a focused and active mind. It’s also a great way to bond with your children and grandchildren. You probably won’t be able to play hockey with them at 70, but you can all study Tae Kwon-Do. Jerry earned his 2nd degree black belt at 73. 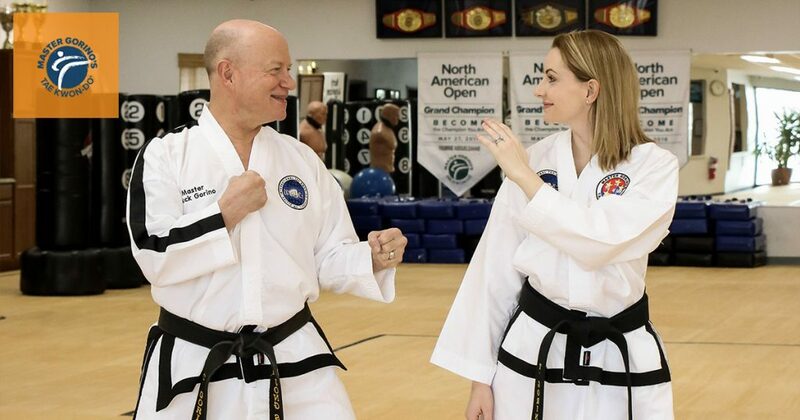 My instructor, Grand Master Park, is 77.